When I worked at Temple University, I discovered the line of food trucks outside on campus. Some were better than others, and since I have a strong preference for Ethnic Cuisines, I hit the one Korean Food truck heavily. She had this beef dish that I particularly liked. It was thin slices of beef with a sweet and savory spicy sauce, that had a mild bite to it. All of this was served on rice. When I left Temple, I left that dish behind. Recently the local Pei Wei had a dish they called "Korean Beef" that was close. Their version was much more "hot" and that is the general reputation of Korean food. I'm assuming that may have been more "accurate", but I am not really sure. Then, after I having had it for about six months, the dish went away. "Pop!" all gone. I had to find something else there. But I never forgot about my food truck and the wonderful Korean Beef. One day recently I got curious and found out that this is called Bulgogi and is one of those "national dishes" that are served all over Seoul and the rest of Korea. Now there are a few tricks to this. First it is VERY easy to make. The process is to marinade the beef overnight in the sauce, then cook it in the skillet. We didn't. Since we used extra lean ground beef, we just poured the sauce over the meat at the end after draining and in doing so made the whole meal in one skillet in 15 minutes total. 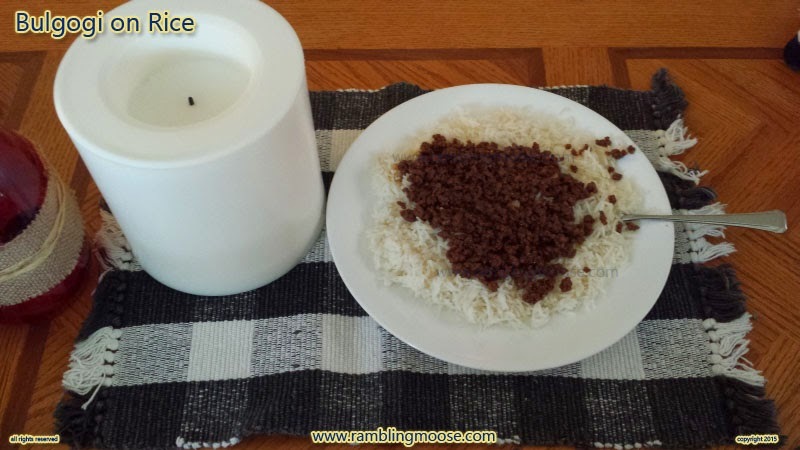 It took longer to write this blog posting than it did to make this dish with rice and ground beef. Second, the sauce would work well on any other meat I can think of, as well as a vegetarian meat substitute like "Crumbles" or Tofu. Third, Just enjoy it. If you want hot, add extra pepper. This recipe was warm and savory with just enough pepper that it didn't linger long afterwords. Fourth, you can use the 95% extra lean ground beef if you are trying to keep your diet low fat. We did this and did not have to add any binders and ended up with a very healthy meal as a result. Like I said, it's easy! We will be having this again and again. To make marinade, mix together the Brown Sugar, Soy Sauce, Sesame Oil, Red Pepper Flakes, and Ginger. then add the marinade to the skillet and reduce to a sauce. For other "intact" meats, you will marinade the meat in the mix overnight. Remove the meat from the marinade setting the marinade aside. Brown the meat in skillet fully with the vegetable oil, garlic, and green onions. Remove excess fat from the skillet and add back in the marinade. Simmer the marinade and meat together until the marinade cooks down into a sauce. Serve with rice or noodles, and any side dishes that you might like.